Register Log In GliderCENTRAL Forums Bonding & Relations I am too nervous to try introductions! Hi! 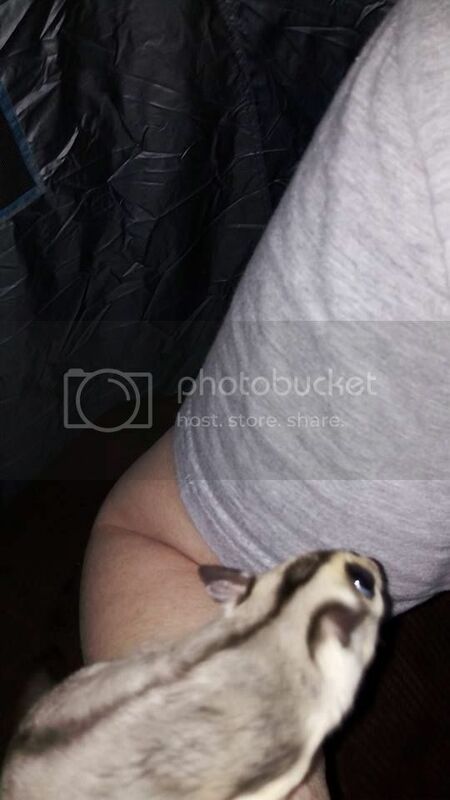 Here's the story: I adopted my first sugar glider, a young female, from an acquaintance who no longer wanted her about a year and a half ago. Skye is good natured but on the energetic side. I always felt badly that she was an only child, but it was all she ever knew and she seemed fine. We have been quite happy. A few weeks ago I was talking to a friend who does animal rescue and rehoming. He had taken in two gliders (from different people) and asked if i would be interested in taking them to be friends for Skye. After much debate and a lot of research, I decided to go for it. My main concern at the time was that one glider was a 3 y/o male. However, after getting to know "Stuart" I have yet to see any evidence of that (no head or chest patches, no apparent marking behavior, and I have not seen a pom). I have been gradually working on bonding with the new kids individually and it is going pretty well. The two newbies are still in their small separate cages and I would love to let them into my large cage with Skye. But I am terrified. Twice I have taken Skye and Lucy into the tent together in their pouches, but have been too afraid to let them out together and only have let one out at a time. Skye is SO EXCITED and wants to get into the pouch with Lucy. She latches onto Lucy's pouch and claws at it. I think she is just excited, but I can't tell for certain it isn't aggressive. Lucy doesn't really seem upset about it, but I can't say for sure. Even if it is just enthusiasm, I don't want Lucy to get overwhelmed. Skye is much more interested in Stuart and Lucy then they are in her. I have read some very helpful advice and stories here about introductions and I sure do appreciate it. I guess I am most interested right now about any insight as to differentiating between enthusiasm and aggression; how fast or how slow to take things; what to do if they DO end up fighting; really I am feeling overwhelmed. I really want them to all be happy together and I would appreciate any support or suggestions! Thank you! My main concern at the time was that one glider was a 3 y/o male. However, after getting to know "Stuart" I have yet to see any evidence of that (no head or chest patches, no apparent marking behavior, and I have not seen a pom). It is very possible that Stuart is a neutered male with pom off when it was done. Twice I have taken Skye and Lucy into the tent together in their pouches, but have been too afraid to let them out together and only have let one out at a time. Skye is SO EXCITED and wants to get into the pouch with Lucy. She latches onto Lucy's pouch and claws at it. I think she is just excited, but I can't tell for certain it isn't aggressive. Lucy doesn't really seem upset about it, but I can't say for sure. Even if it is just enthusiasm, I don't want Lucy to get overwhelmed. Skye is much more interested in Stuart and Lucy then they are in her. It certainly appears that Skye is very interested in having some new friends by her actions. In addition, I think the lack of any very aggressive behavior from Stuart and Lucy is a good sign. Because you have had Skye as a lone glider, I completely understand your wanting to make sure there are no mistakes with introductions. 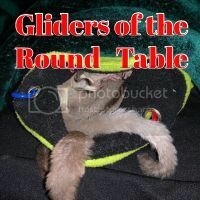 Have you read this Article: How To Introduce Gliders To Each Other ? I think it will help you and give you some confidence with the introductions. I was terrified to intro Stewie with the girls too!!! I was fine with it till it came to "the day". When I did intros with the girls after 30 day quarantine, all went really well. They were about the same age, but Dot out weighed Fiona x2. Last edited by Ladymagyver; 09/28/18 03:41 PM. Still have not put mine together. I am not sure I want them all in the same cage-unless I get a much larger cage! Back to you...how are your little ones doing? Last edited by Claralice; 10/08/18 11:52 PM. Dot and Stewie still get into scuffles at dinner time. Dot's food aggression is at a peak right now. Stewie lately has caved in and now stays in the pouch with Fiona. The more I intervene, the worse it gets. Other than food, all is well. Last night I tented both dishes so they can't watch each other eat. I'm giving that a few days to see how it goes. So far Dot calls them to her dish, makes a weird hiss and they go back to the pouch... When she's full she goes back to bed and holds both of them in there with her. If hiding the dishes from sight doesn't work, I will have to pull corn out of the salad mix again. Hi everyone! I decided to let Lucy and Stuart be in the same cage for the first time while I deep cleaned the habitats the other day. I did it during the early afternoon while they were sleepy and it went very well! Stuart explored Lucy's cage briefly when I popped him in there, and then went right into her pouch. She didn't make a peep. When it was time to do that cage I simply moved the pouch into Stuart's. I am so proud of them! I separated them for the night, however. Dawn, I hadn't even thought about food aggression until your posts. More to worry about -- but good to be prepared. I hope that Dot will calm down about that! I am feeling pretty good about L+S being safe together. Next step will be to try tent time with one of them with Skye, the wild child. Thank you guys so much for your support!